Hi everypony! Some people already know me from staying up in the chat and the side stories doc until ungodly hours (like the one at which I'm posting this now; 4:30 AM, I must be crazy). 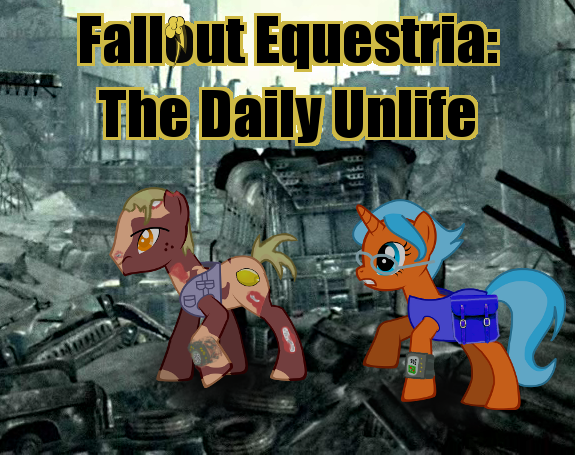 So anyway, I've always wanted to read a story about the daily life of a ghoul in the Fallout Equestria world, to see their general look on things. Since no one seemed to have written one, I started one myself. Note that this story isn't very serious. That doesn't prevent it from being quite an emotional rollercoaster though; being a ghoul, the main character has obviously been through some really awful stuff, like seeing everypony die, and well, dying, of course. This story is also completely character driven. It really just tells the story of a ghoul who leaves his stable and goes out in the wastelands, expecting nothing, and taking everything as it comes. If this story will ever get an overbearing plot (the story kind, you pervs), I assure you it will be entirely by accident. 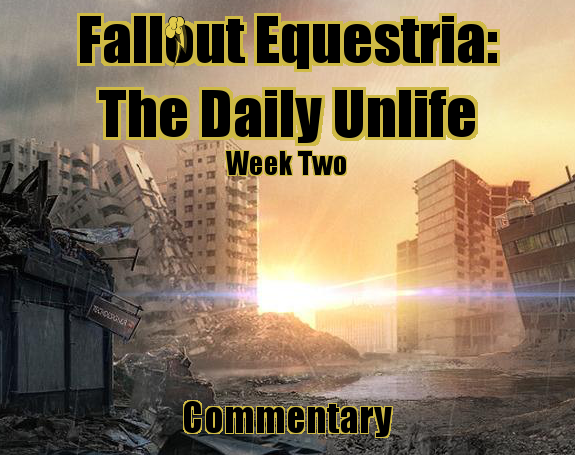 And before you ask, yes, that has happened before, in some of my totally non-MLP-related writings. Last edited by Nyerguds on Tue Jul 07, 2015 5:53 am, edited 19 times in total. Well. This is a strange fic, but it does have a charm on its own. Lets get down to brass taxes. The main character is fine, but he really seems to know a bit too much. Explosive collars blast direction and pressure weaknesses? Just What the heck has he been up to prewar / while "scavenging" ? Though i guess Ditzy explains most of that in her book. HMM. More exposition! He's usually trying to look knowledgeable while he doesn't have much real experience in the wastelands, besides the mentioned "book knowledge". But yeah, the Guide would probably have some info about slavers and the specific nastiness of their collars. Him knowing that specific type of collar is probably pure bluffing, though. As the chapter 0 perk says, he's kinda prone to doing crazy things. This looks intruiging. I'll have to read it at some point. Day Four: Living The Dream is now posted. I also made an index document on Google Docs with all GDocs chapters. Not as if anyone actually looks here, but eh. Day Seven: Do You Want To Live Forever?